These are neat! I’ve never seen one that you could hang up on the tree as well! I often seen the regular one (minus the string) around this time of the year in the dollar store, I hope to find some with the string on though, it’ll be nice to hang it up in the tree or use it as an ornament when wrapping gifts! With your well-decorated Christmas tree and some other ornaments you set up in your place â€“ your house must be filled with Christmas galore with all the works and trimmings including brimming candy dish with festive chocolate candies. except we have a big, fat ceramic cat with a head that comes off. We fill up the hollow belly a mix of toblerones, hershey’s nuggets, local chocs and candies, m and m’s, small bars of cadbury’s and what have you’s. the nephews know its christmas when the fat cat comes out of storage. they love it even more because they don’t need to ask permission to take anything out of the “belly of the big, fat cat”, unlike on regular days when their chocolate and candy intake is strictly monitored. Hi! I’m from Bacolod, Negros Occidental and I frequent your blog. It has been a tradition since this family was established for 16 years now to make something “homemade specials” as gifts for families and friends. Christmas is always a good time to do that. This year, it’s the “Pampagana Trio”: Sinamak Bisaya, Special Atchara and Mama’s Uyap (pls visit http://www.jensnursingchronicles.blogspot.com and read all about it). It was quite tedious but I know each bottle is special because it comes with love and good cheers! Merry Christmas, MM, from our home to yours! Too pretty to eat!!! I should prepare a candy bowl this year too (although i don’t think it’ll last through the week! )i am soooo enjoying your holiday posts, MM. Looking forward to more of your holiday cheer. Was it Park Lane Hotel that you stayed in or the Marco Polo Hong Kong Hotel? That’s a great idea! I’ll prepare a bowl of sweets for our home… Both kids (my nephews/nieces/inaanaks) and adults will love it! Thanks! I miss this tradition. My mom would put out a few bowls with different treats like sugared jellies, including these chocolates(usually from visiting relatives). My brother and I would sometimes find these in our xmas stockings. It’s been decades and reading your post truly truly brings back fond christmas customs. Would anyone know if these chocolate ornaments are available in the Philippines? 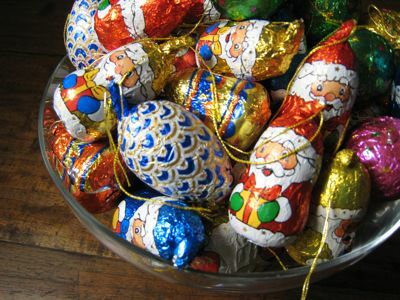 It would be nice to put these on a small Christmas tree where kids can choose which chocolate they want once they enter your house… a nice welcome treat for the kids on Christmas. Blaise, same here, we all love chocolates…. i seem to remember last year you had red and silver balls. Someone I know said there is a newly opened resto on the 6th? floor that has nice views of the harbor. Its name is Cucina. I think the Wellcome supermart you went to is the one on the 3rd flr near HK Hotel.. I am a huge fan of your blog and I always have fun trying to guess some stuff you don’t mention right away. arlene, they were about HK$30-35 per bag, or roughly PHP200+; I used four bags for a medium sized bowl. Educational Plan Fiasco — Scholarship Plans Philippines, Inc.